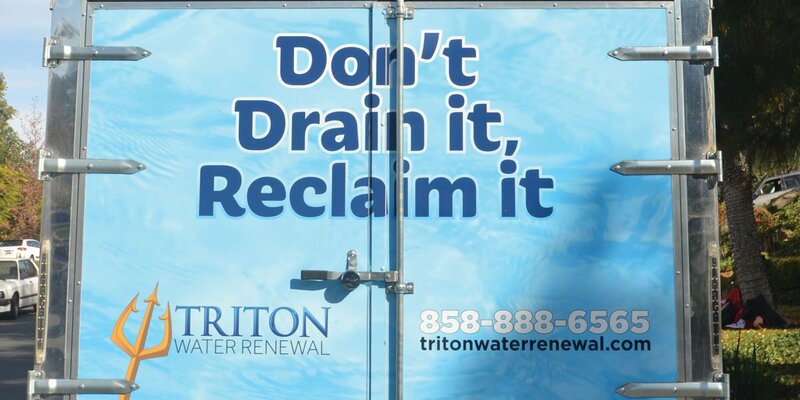 Triton Water Renewal – don't dump your hard pool water, Renew it! White calcium deposits on your pool tile or stone surfaces? Using more chemicals to get and keep your pool clear and swim friendly? Tired of red eyes, dry, and stinging skin when you get out of your pool after a day of fun? You’re a victim of extremely hard water. WE CAN HELP! NO Draining, save your plaster, environmentally friendly, saving you time and money at the pool store. Pool owners ­know that pools require draining every two years due to the presence of high calcium, total dissolved solids and other hardness minerals which cause challenges with water chemistry, water safety and swimmer enjoyment. 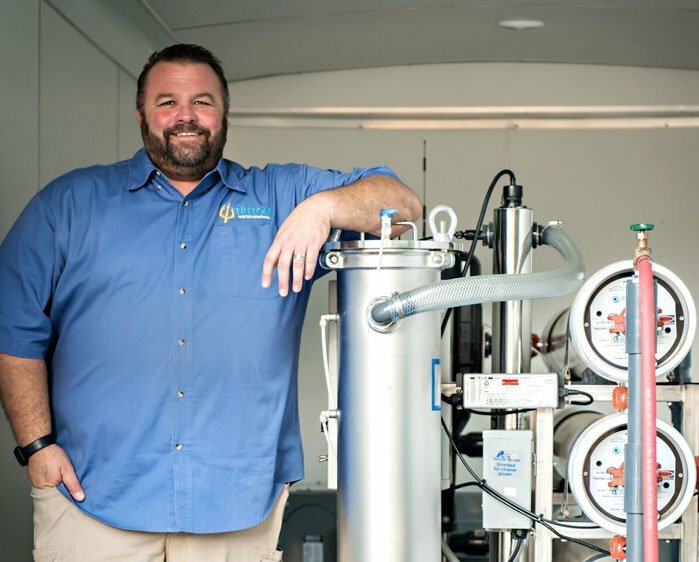 These mobile filtration trailers utilize Reverse Osmosis (RO) filtration to lower Calcium Hardness (CH), Total Dissolved Solids (TDS), Cyanuric Acid (CYA), salt and other hardness minerals. 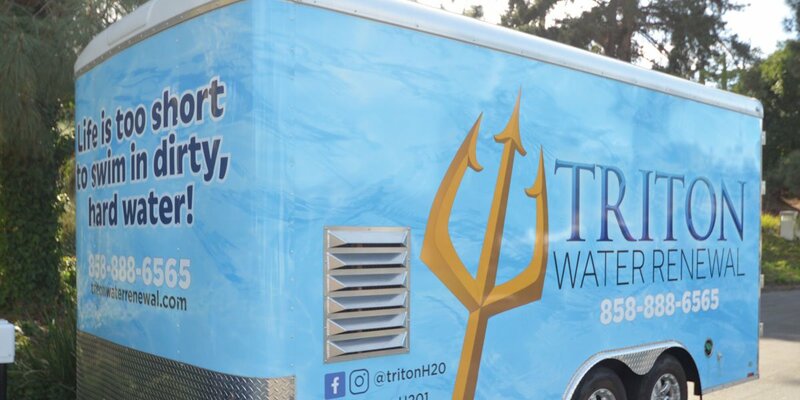 “The Triton Treatment” not only conserves nearly 85% of the water already in the swimming pool, but also leaves our customers with cleaner water in their pool than a typical drain and refill would. Water conservation, a swimming pool that is cleaner, safer and healthier for your family- all the benefits of maintaining your investment with Triton Water Renewal. Why hassle with pumping the water from your pool, paying for the refill and then trying to figure out the complicated chemicals needed to re-balance your pool water when Triton Water Renewal can take care of it for you? In less than a day, Triton Water Renewal can filter your water and give you back a clean, fresh pool! Make the call to give your swimming pool the proper care it deserves and start enjoying the benefits of 'The Triton Treatment' now. You'll be glad you did! 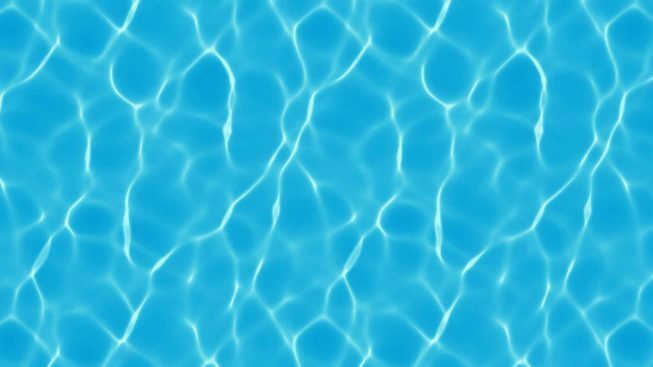 In the past, residential swimming pools have required a drain and refill every 2-3 years to maintain proper water balance and to protect plaster and equipment. Commercial pools can be even more frequent due to greater usage and higher chemical levels required for sanitation. Exposing the plaster during a drain and refill can cause plaster damage and/or failure; an expensive repair! In other occasions, pools have "popped" out of the ground as the water is removed and the pool "floats". Why risk damage or waste your existing water when there is a better, safer solution that also allows you to be a good steward of water resources? Water conservation, no risk to your pool and clean, safe water requiring less chemicals to maintain... It's a win-win situation! Triton Water Renewal is proud to partner with you to conserve this increasingly limited resource. You will feel good that you no longer have to watch your existing pool water go down the drain or worry while you pump the water and expose the finish of your pool. Our self-contained unit requires nothing from you other than a garden hose to replace the small amount of water lost in the process. We will bring our own power and supplies and in return, we will leave you with water far superior to a drain and refill; water that earlier in the day was old, tired and unsanitary. Congratulations; you just conserved 85% of that water, and provided your family with a clean, safe pool! We had so much calcium in the water and needed a solution. With the calcium counts in today's tap water, and a desire to be environmentally conscious, draining was not an option we really wanted to pursue. So we went with purification. Jeff did a great job of explaining the process and the benefits. Once we decided yes, he was over the next day and by the following morning our water was better than new. Great experience all around. Jeff explained the process in great detail. He was thorough and very professional. If your pool water needs to be changed, don't drain it. The reclamation process is cheaper and the water is cleaner than you will get from simply re-filling. I definitely recommend! Jeff at Triton was very knowledgeable and the system worked great! After the machine ran for about 18 hours to filter our 15,000 gallon in ground pool, our water tested basically as purified drinking water. I went this route because we all need to still conserve water and I couldn't see just flushing 15,000 gallons down the drain to refill with another 15,000 gallons of unpurified tap water from the city. I will go this route every single time I need to flush my pool. Don't flush, recycle. Being on a well is hard to keep our pool water perfect. We thought our only option was to drain and refill until we heard about Triton. Triton was able to filter out existing water without much waste and lower our TDS significantly. Jeff was great and explained the RO process to us as well as monitored our pool’s chemical balance for the entire process. Our regular pool servicer came by today and commented all our levels look excellent. Thank you Triton!! /up to 20,000 gal., some restriction apply. *Commercial water purification is available upon visual inspection. This includes college and high school pools, city and gym pools, and hotel pools. Due to the complicated nature of pool chemistry with large amounts of water and daily use. Inspection is required of pool equipment and water testing before an estimate can be given. 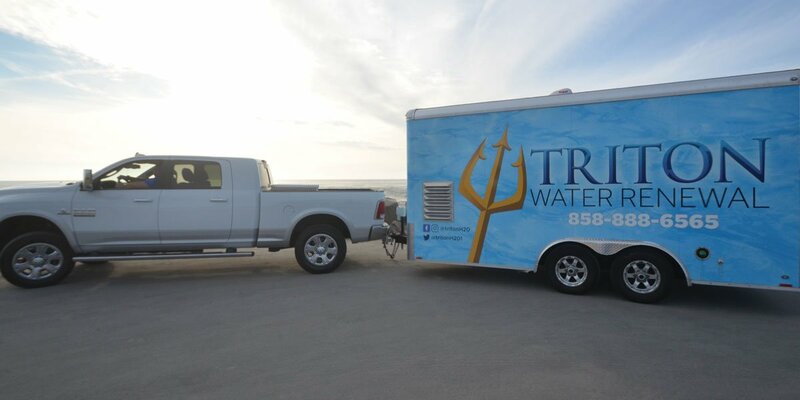 Triton Water is committed to excellence in the water purification business.